Last week, (Along with the following 2 weeks) we've been working on a big book review. What makes these reviews so big is that all of Mrs Anderson's reading group will all be doing a whole bunch of activities based around our books. Activities such as make a movie trailer for the book, make a comic strip about the book, and even create a map of your stories setting! 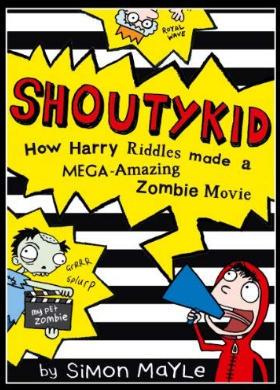 The book that I chose to make a review on was SHOUTYKID How Harry Riddles made a MEGA-Amazing ZOMBIE Movie. I chose this book because I had already read one of the books to this series, and enjoyed reading it so much. Also the fact that the main character (Harry Riddles) has a lot in common with me. The activities that I have started working on is to create a game about the story, and create a comic strip. I have already had a lot of fun doing this, and cannot wait until I am finished both reading, and innovating.